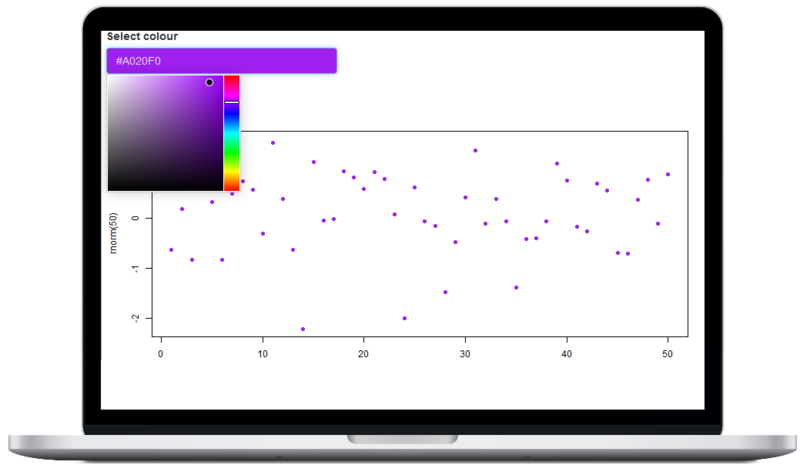 colourpicker gives you a colour picker widget that can be used in different contexts in R.
The most common uses of colourpicker are to use the colourInput() function to create a colour input in Shiny, or to use the plotHelper() function/RStudio Addin to easily select colours for a plot. As mentioned above, the most useful functions are colourInput() and plotHelper(). 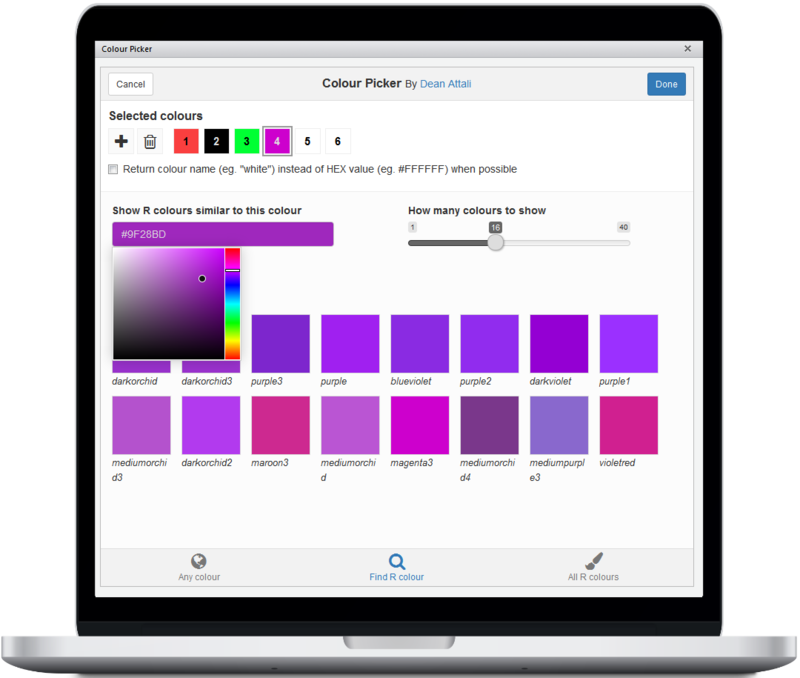 Click here to view a live interactive demo the colour input. The GIF below shows what the Plot Colour Helper looks like (the GIF is from an old version that did not support opacity/transparency for colours, which is now supported). Scroll down for more information about colourInput(). If you've ever had to spend a long time perfecting the colour scheme of a plot, you'd find the Plot Colour Helper handy. It's an RStudio addin that lets you interactively choose colours for your plot while updating your plot in real-time, so you can see the colour changes immediately. To use this tool, either highlight code for a plot and select the addin through the RStudio Addins menu, or call the plotHelper() function. The colours selected will be available as a variable named CPCOLS. 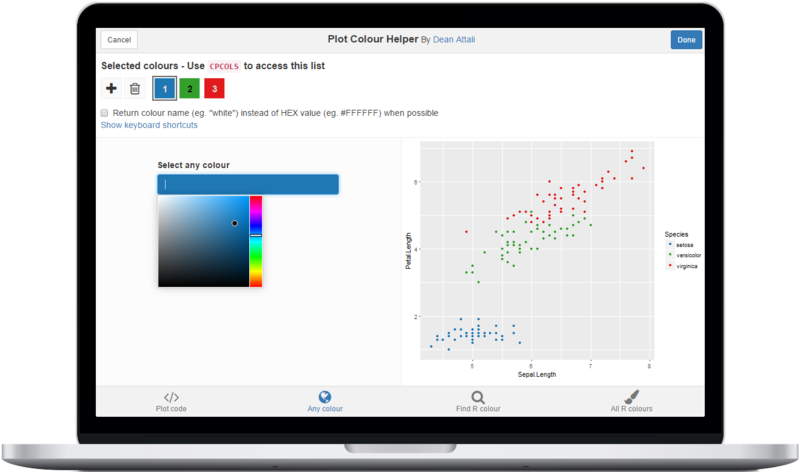 Scroll down for more information about the Plot Colour Helper. colourpicker also provides a more generic RStudio addin that can be used to select colours and save them as a variable in R. You can either access this tool using the Addins menu or with colourPicker(). You can also watch a short GIF of it an action. The colour picker input is also available as an 'htmlwidgets' widget using the colourWidget() function. This may not be terribly useful right now since you can use the more powerful colourInput in Shiny apps and Rmarkdown documents, but it may come in handy if you need a widget. Using colourInput is extremely trivial if you've used Shiny, and it's as easy to use as any other input control. It was implemented to very closely mimic all other Shiny inputs so that using it will feel very familiar. 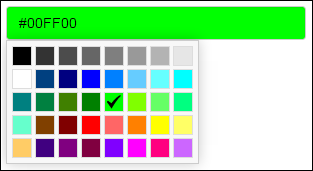 You can add a simple colour input to your Shiny app with colourInput("col", "Select colour", value = "red"). The return value from a colourInput is an uppercase HEX colour, so in the previous example the value of input$col would be #FF0000 (#FF0000 is the HEX value of the colour red). The default value at initialization is white (#FFFFFF). If you use the returnName = TRUE parameter, then the return value will be a colour name instead of a HEX value, when possible. For example, if the chosen colour is red, the return value will be red instead of #FF0000. For any colour that does not have a standard name, its HEX value will be returned. A simple colour input allows you to choose any opaque colour. If you use the allowTransparent = TRUE parameter, the input will display an additional slider that lets you choose a transparency (alpha) value. Using this slider allows you to select semi-transparent colours, or even the fully transparent colour, which is sometimes useful. When using transparent colours, the return value will be an 8-digit HEX code instead of 6 digits (the last 2 digits are the transparency value). For example, if you select a 50% transparent red, the return value would be #FF000080. Most R plotting functions can accept colours in this format. If you want to only allow the user to select a colour from a specific list of colours, rather than any possible colour, you can use the palette = "limited" parameter. By default, the limited palette will contain 40 common colours, but you can supply your own list of colours using the allowedCols parameter. Here is an image of the default limited colour palette. Using a 6-character HEX value, either with or without the leading #. For example, initializing a colourInput with any of the following values will all result in the colour red: ff0000, FF0000, #ff0000. If transparency is allowed, you can use an 8-character HEX value. Using a 3-character HEX value, either with or without the leading #. These values will be converted to full HEX values by automatically doubling every character. For example, all the following values would result in the same colour: 1ac, #1Ac, 11aacc. If transparency is allowed, you can use a 4-character HEX value. Using RGB specification, such as rgb(0, 0, 255). If transparency is allowed, you can use an rgba() specification. Using HSL specification, such as hsl(240, 100, 50). If transparency is allowed, you can use an hsla() specification. Protip: You can also type in any of these values directly into the input box to select that colour, instead of selecting it from the colour palette with your mouse. For example, you can click on the colour input and literally type the word "blue", and the colour blue will get selected. By default, the colour input's background will match the selected colour and the text inside the input field will be the colour's HEX value. If that's too much for you, you can customize the input with the showColour parameter to either only show the text or only show the background colour. Call the plotHelper(code) function with plot code as the first parameter. There is a small difference between the two: invoking the addin via plotHelper() will merely return the final colour list as a vector, while using the Addins menu will result in the entire plot code and colour list getting inserted into the document. You can always change the plot code from within the tool. You can set the initial colour list by providing a vector of colours as the colours parameter to plotHelper() (eg. plotHelper(colours = c("red", "#123ABC"))). Alternatively, if you don't want to initialize to any particular set of colours, but you want to initialize with a specific number of colours in the list, you can provide an integer as the colours parameter (eg. plotHelper(colours = 2)). If the colour values are not provided, then a default palette of colours will be used for the initial colours. This palette has 12 colours, and if there are more than 12 colours to support then they will get recycled. There are several keyboard shortcuts available, to make the selection process even simpler. Spacebar to add another colour, Delete to remove the currently selected colour, Left/Right to navigate the colours, and more. You can view the full list of shortcuts by clicking on Show keyboard shortcuts. When the tool is run as an addin, the final colour list and the code get inserted into the currently selected RStudio document (either the Source panel or the Console panel). If the tool is called with plotHelper(), then the return value is simply the vector of selected colours. You can assign it into a variable directly - running cols <- plotHelper() will assign the selected colours into cols. Since the plot code requires you to use the variable name CPCOLS, after closing the plot helper tool, a variable named CPCOLS will be available in the global environment. The colours returned can either be in HEX format (eg. "#0000FF") or be named (eg. "blue") - you can choose this option inside the tool. colourInput() now supports an alpha channel, to allow selecting semi-transparent colours, using the allowTransparent boolean parameter. Note that this is a BREAKING CHANGE because previously allowTransparent=TRUE resulted in a checkbox, and now it displays the alpha opacity selector. It is now possible to type the value of a colour (using any of the above versions) directly into the input field. For example, you can type "rgb(0, 0, 255)" directly into the input field to select the green colour.